Rug Cleaning Walton-On-Thames - Oriental Rug Spa offer a specialist Persian, Oriental and Contemporary rug cleaning and rug repair service. If you own a dirty or soiled rug that needs professional cleaning, then why not give us a call on 01276 423150. You can drop the rug into our wash facility or arrange a time for us to collect from you. 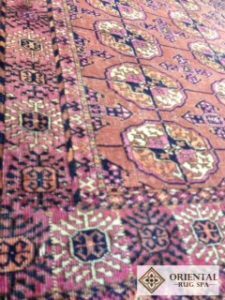 Tekke rugs are woven by the tribe of the same name. The tribe migrates through Turkmenistan. There are many tribes throughout Turkmenistan including Salor, Saryk, Chodor and Yomut. Each tribe has distinguishing design attributes associated with their weavings. The guls that you can see within the main field are one of those defining characteristics. Gul means flower and they represent a flower viewed from above. The guls in the rug to the left are typical of the Tekke tribe. Older rugs tend to have fewer guls spread through the design compared to more recent weavings. 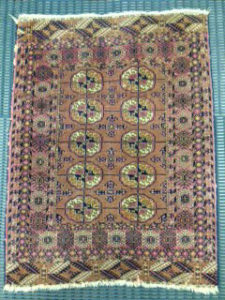 These designs are widely copied within other rugs, such as those woven in Pakistan. The rugs known as Bukharas typically display this type of design.